First Presbyterian Church hires fifteen interns every summer. The supervising pastor heard that you have taken this class and asks you to speak to the interns for about 15-20 minutes. These interns will be working with existing groups in the church and will be responsible to plan and prepare programs (with or for them). You will tell them, in your own words, what major concerns they need to attend to as they develop and implement ministry through these programs. In giving this advice, feel free to illustrate your points using examples from your own experience, stories you have heard in class, or to cite publications (though it is not necessary for you to do so). This “talk” should be about 5-7 pages and will be evaluated on the basis that its’ points are clearly stated and explained, and are internally consistent with each other. Congratulations on your internship this summer at First Presbyterian! I know you’re excited to be here, and you should be – this is a great place and you’re going to have a great summer. As I’ve been asked to speak to help prepare you as an intern, I feel the need to more clearly define the term. According to my dictionary, an “intern” is “a student or trainee who works, sometimes without pay, at a trade or occupation in order to gain work experience.” Sounds noble and something to aspire to, right? Maybe, but let me suggest you broaden your definition; I offer this as an add-on: “one after the other” (“in turn,” get it?). You see, the good news is you’re one of fifteen interns chosen to minister here at First Presbyterian for the summer; the other news is there were fifteen different interns sitting where you’re sitting last summer and, Lord willing, there will be fifteen different interns sitting where you’re sitting next summer. In other words, you – and they – are, were, and will be part of an established system here at First Presbyterian – one that has been here before you and, God willing, will be here after you as well. Having this perspective is very important as you consider your place and time in the here and now because, as you probably noticed, I didn’t say First Presbyterian is, was, or will be a perfect system; actually, it’s a fairly flawed one. It’s flawed because it’s made up of flawed people. If you don’t believe this, then you’re about to find out. You’re about to find out that those to whom you look for leadership can be distracted and demanding. You’re about to find out that those who will look to you for leadership can be impatient and selfish. You’re about to find out that those with whom you labor can be prideful and competitive. Oh, and you’re about to find out that you can be all of the above…and more. The other thing you’re about to find out is that all of these flaws (and more) have unfortunately made their way into parts of the First Presbyterian system. People you’ve never met (nor will) are responsible for problems you’ll encounter this summer, and the sooner you recognize that these problems don’t begin or end with you, the more you’ll be able to help First Presbyterian and those who comprise it now (as well as in the future). As you might discern from the title, we're scheduled for a 30-minute family photo session this morning at Forest Park. Unfortunately, it's going to be all of 45-degrees at the time of our 9 a.m. appointment, but at least it looks to be clear instead of rainy (otherwise, we were going to take the photos under The Muny awning, which would only be good if we got them to pay what we're paying as advertising). Maybe it's because I don't consider myself particularly photogenic (or maybe I'm still scarred by the 1985 family portrait my mom, dad, and sisters had taken in front of an Olan Mills generic grey background set up in a Pike County hotel room – weird), but I've never really liked formal family pictures (I can't remove myself from the viewfinder); the other part is that, in the aforementioned family portrait in 1985, all of us dressed in pastel and looked like extras just off the set of Miami Vice. Smiling is hard for me – not because I don't have things to smile about (nor do I NOT EVER smile, as some have accused me of); I just tend to smile at things that MAKE me smile, rather than because someone with a camera TELLS me to smile. Doing otherwise feels fake to me, and this feeling, combined with the fact that someone with a camera is about to capture my fakeness on film, makes me want to smile less. I'm not one for posed portraits; I prefer a more candid approach. This, of course, requires more time than 30 minutes really allows, as it takes time for the family (okay, for ME) to feel comfortable enough to relax with someone looking at you through a lens and be photographed. I'm not a supermodel and am hardly infatuated with the idea of someone following me around with a camera to catch that perfect angle (actually, I don't think I have a perfect angle, let alone a "best side" – all mine are fairly flawed). Crazy Horse refused to have his picture taken because he believed a picture stole the spirit of its subject. I think just the opposite: I hate having my picture taken because I've rarely taken one that I feel "captures" anything of who I am. Paul Simon once said that a song is like a picture that captures who you were at that time, but as you look back on it, you recognize that, indeed it's you, but it's NOT REALLY you, as you've changed. I suppose that's why we take pictures, and I get the need to do so (especially if you have kids), but capturing such change and transition is why I write, not why I sit for a photo session. My daughters love playing with PhotoBooth on the Mac and capturing themselves in a picture, but I'm content to frame who I am with words rather than pictures, probably because words are black and white (and not pastel), or perhaps because there's a timelessness to words that pictures don't always preserve. I don't know. Let me just say that I’m fairly astounded by a lot of things in this – the songwriting, the singing, the acting, the quality of the recording – but none of them compare to the power and thrill of live, unedited performance. Bravo. Me: "Boy, C.C. Sabathia sure has good control tonight." Her: "Yeah, I never know where the ball is going to go when I pitch." Me: "He's got them swinging at a lot of bad pitches." Her: "Yeah, I swing at everything…pretty much." Me: (as A-Rod successfully steals second): "It's a good thing he slid or he would have been out." Her: "Yeah, I hate sliding. It gets me all dirty." She is the Tim McCarver to my Joe Buck; the color commentary to my play-by-play. It's tough being married to a celebrity, as more and more people know me as "Megan's husband." This will probably continue for at least another month since I'm married to one of the six official members of the St. Louis Mom Squad. The cool part is the role comes with new wheels (temporarily, that is – click link for details). As it was a slow day in the bookstore yesterday, I read the first 75 pages of Donald Miller's new book, A Million Miles in a Thousand Years. The first couple of chapters have some great quotables about understanding life as story, and the following chapters provide humorous illustration of the ideas. I liked it. My wife and daughters are pretty excited that Owl City is coming to The Pageant in January. Megan is contemplating getting tickets for all of us to go as a family, which I'm presuming would probably be different from their normal crowd. I've always wanted my own op-ed column in a newspaper; this opportunity with the Washington Post may be my big break (of course, it requires me writing something for consideration – any suggestions?). In case you hadn't heard, I reluctantly started using Twitter a few weeks ago. While I'm still evaluating its real value (some general stats), I have enjoyed following/stalking a few people here and there (search for "SecondDrafts" to see whom, as well as to follow me if you like). That's it for now. I need to finish well the day so as to get ready for the black tie/red carpet vehicle pick-up tonight with the Mrs. and Misses. Honestly, I don't mind being "the husband," but the paparazzi can be annoying. 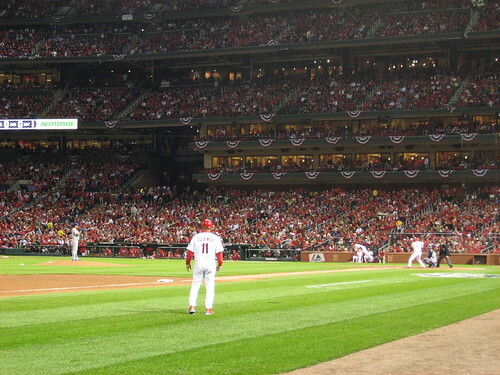 Thanks to my friend, Mark, I was one of the 47,296 (new record attendance at Busch Stadium III) who watched the Cardinals' last game of 2009 in the chilly October air. Unfortunately, the Redbirds lost to the Dodgers, 5-1, putting the final touches on one of the worst post-season collapses I can remember (at least we had great seats for the bitter end – section 162, four rows back, halfway between third base and left field). 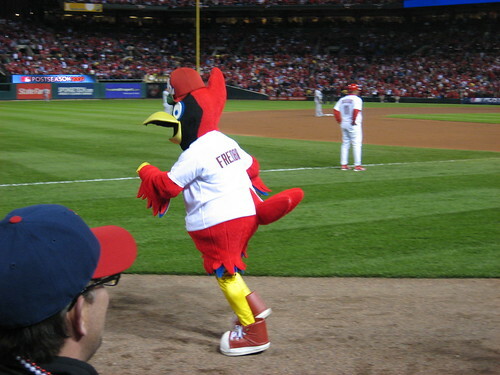 When I wasn't shivering (it was 60-degrees when the game started, and at least 45 by the game's end), I watched Fredbird try to entertain a less-than-enthusiastic crowd. And, when I just couldn't take it anymore (i.e. 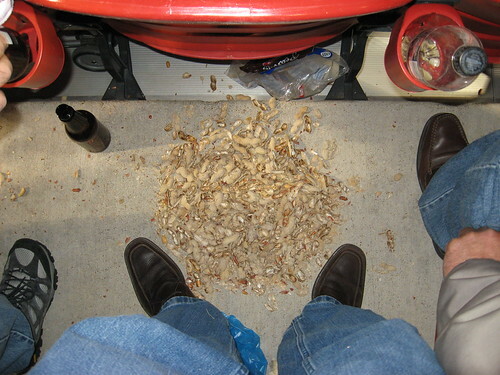 after the Dodgers scored two runs in the 3rd to be up 3-0), I tried to drown my sorrows with a Coke and a bag of peanuts. Didn't help. Alas, what was in many respects a very good season through August, fell short of being a great season by September's end, and the October postseason was, needless to say, forgettable. I can't believe how poorly we played the past six weeks, nor that we got swept by the Dodgers (who we beat 5 out of 7 times this year already) in the NLDS. Indeed, there's no crying in baseball; there were, however, more than a few sighs at Busch Stadium tonight. Reading in chapter 15, I really liked and “resonated” (pun intended) with the metaphor of people being stringed instruments. I also really appreciated the admonishment to be more aware of our individual “tuning” so as to be more capable of discerning what’s going on in us and in others when tension and conflict emerge. Contagion of sin fascinates me: passages in Psalms and Proverbs promise our sin will pass down to third and fourth generations, but we also pass on sin to those in the same generation (and often the same room). “Sin migration” intrigues because, though sad, it’s so tangible to watch. My vibrating strings cause others’ string to vibrate for good or ill (and vice versa) – sometimes we make beautiful music together; other times, not so much. I liked how the authors talked about how vibrating strings “may prevent you from seeing the situation more fully and may inhibit you from responding in productive ways” (199). I apply this idea when, over a period of a few hours or even days, I can get worked up over something that someone else’s additional vibrations playing along inflame by adding to the noise. This is why gossip and slander are so dangerous for me, and why I do my absolute best to try to avoid them – they can vibrate all too easily in my own mind and heart. This leads to the third point I really appreciated: “When others know how you are tuned, they have more power to entice you to partner with them to support their own interests or to derail you from yours” (199). This could also be translated as “pulling one’s chain,” or in the authors’ language, “plucking one’s strings.” I wouldn’t say I’ve fallen prey to others too often in this, but that has more to do with the quality of character and trust of those around me more than anything. As the authors note, our greatest strength is often our greatest weakness. My intuition can easily be an Achilles Heel in the hands of others with different motives other than love. Thankfully, those around me recognize who I am and how I think; they love me by not trying to stifle or manipulate my intuitive sense, but at the same time, they help keep it in perspective by trusting me with their need and desire for it. There's nothing like someone looking you in the eye and depending on you to keep you honest. The Major League Baseball playoffs officially begin today and the Cardinals are in the thick of the race. Unlike 2006 (when the Redbirds surprisingly won the World Series), I'm not concerned with the pitching; it's the hitting that worries me. I won't bore you with statistics, but let's just say we could improve in the offensive department. St. Louis (as well as throughout the country) are watching closely. with others than we sometimes do now. I still feel that way – even more so now that our local ESPN radio affiliate is carrying all the playoff games in addition to the Cardinals'. It's fun listening to different announcers broadcast from different cities for different teams. It feels like folks are paying a little more attention to the same thing, which in our highly-diversified media, doesn't happen all the time. It's one game at a time – best of five for the pennant, best of seven for the Series – and anyone who cares about baseball is watching or listening. Personally, I'm hoping for a Cardinals/Yankees series, as these are the two most classic franchises in the game (yes, Red Sox and Cubs fans, you heard me). I hope it goes seven games, and I hope the Cardinals win. But even if they don't, as the weather chills and the leaves fall, watching a game or two, popcorn in hand, will be a most enjoyable way to spend an evening in October. I'm saying Cardinals in seven. Care to make your prediction? For those about to accuse me of party-pooping or being a kill-joy, rest assured: you’re not the first and won’t be the last. Keep in mind you’re reading the blog of a guy who actually fell asleep at his senior prom, as well as on more than one occasion has used his newborn-, toddler-, and now nearly tween-children (even when behaving well) for as good an excuse as any for leaving a party early. In other words, I’m not a game-player. But I appreciate that you might be. Just don’t ask me to play with you. Ever. That said, why blog about the game Apples to Apples? More than the fact that our family owns it, Megan and the girls love it, and we’ve had neighbor friends over last night and today, I’m writing about the game because it’s perfect to teach kids about relativism. But here’s what makes it “fun” (or so I’m told): the role of the Judge rotates, so the whole point of the game becomes trying to choose not what goes together, but what you think the person thinks goes together. This, of course, can vary depending on the Judge’s relationship to you, not to mention his or her preferences, mood, or reason for choosing (or not choosing) what you present as a match. In other words, egoism, which is a form of relativism. Thomas Hobbes would love this game; David Hume as well. I might have thought my daughter would have labeled her family crazy (at times, we would certainly qualify). And yet, knowing my daughter as one particularly attune to others’ feelings, she would never say that about us (or anyone else). She loves cats and likes penguins, but she doesn’t think of them as crazy; they’re just animals. But fairies? She’s crazy about fairies (or, I should say, the idea of fairies), so that’s what she chose. For her, crazy equals fairies. Personally, I would have chosen snowboarding here, because even after living in Colorado for twelve years, I just don’t get snow sports (something about still being able to walk at the end of the day, etc.). However, as our friends’ nine-year-old daughter (who is as black and white in the decision-making process as they come) was the judge, three guesses as to which she picked? Yep, mashed potatoes. For her, dull equals mashed potatoes. 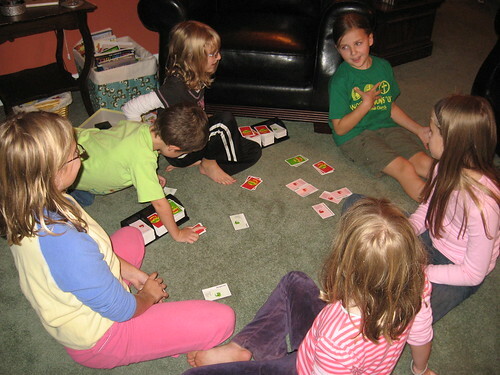 Again, I’m not trying to bash Apples to Apples – it’s an entertaining game and kids of all ages tend to like it (even some of my high school students are fans). Instead, I’m thinking that here’s a perfect opportunity to teach our kids about worldview and human nature by helping them recognize what’s really going on that makes the game so enjoyable. When we’re the Judge, we get to make the matches, while everyone else trying to win has to please us to do so. We don’t have to have good reasons (or any reasons at all) for what we choose – the matches are in the eye of the beholder – and we can even choose against reason to spite someone else just because we can. But what happens when we’re not the Judge? What about when someone (or Someone) else is? Hmmm. If you never invite me over for board games, I’ll completely understand. And don’t worry: I’ll probably be relieved.